Assisi: as Fr Lucie Smith says needs revamping, it is a bit like any ecumenical event, it becomes self-referential, a bit 'same old' a bit dull. I have always justified it to those Catholics who disapprove of 'Assisi', as being the Pope being recognised in some sense as 'leader' of all 'faith communities', I admit its not necessarily good theology. I don't know who draws up the guest list, or more significantly the veto list, presumably for the more important it is the Pope. This year the dear old Dalai Lama being struck from the guest list, that is not insignificant - presumable a more acceptable (to the Chinese and therefore Rome) patriotic Lama was found as a substitute for Chinese approved Tibetan Buddhism. I don't know if the there were other Chinese 'faith communities', most probably not Falun-gong. China and its treatment of Christians is deeply worrying, read this from First Things or the Catholic Herald on organ harvesting. It is pretty harrowing stuff but it is these are people, the Chinese government, Holy See plans to allow to choose Catholic bishops. Patriarch Bartholomew was also there behind and obviously junior to the Bishop of Rome but then to be honest he is always in need of friends (and money) being starved of both not only by Moscow and Athens but also the increasingly hostile Turkish state, which under Erdogan is taking a significant turn against the countries tiny Orthodox community, there have been accusations the Phanar was involved in the coup against him. As things are it is quite possible next year depending on how things develop with Moscow, or whether the Holy See wants a closer relationship with Turkey, he too could be on the way out, or being even more junior. There were of course Sikhs and Bahá'ís who are always glad of an invitation: reaching out to other religions is part of their creed. This time round from the photographs there seemed to be a lack of pagans, animist and spirit worshippers. I don't know if the Vatican prohibits Voodooists, Spiritualists and Satanists, there didn't seem to be many in the photographs. What should not be forgotten is that Assisi is much more a political event than a religious one, increasingly it seems like event to show favour to political friends and disfavour to those who might compromise the Holy Sees global ambitions, as a peace maker of course, and at the table of peace-makers. On the topic of China's treatment of Christians, see also this recent piece from presbyterian Chinese dissident and exile Yu Jie. The ecumnistic meeting in Assisi sent the wrong message. That message implies, to the uninitiated, that all religions are equal. They are not. Some such as Islam are and have been persistently warlike, expansionist and evil since its inception in the 7th century and it has no intention of changing. Muslims should not have been associated publicly with Christianity. Of course it does, it is silly and meaningless. Prhaps under Francis it becomes non- or barely religious and more a poliical meeting. The Muslims who are actually quite religious would never attend such an event and the same is true for devout Orthodox Christians. This type of nonsense is really only supported by those who believe in religious relativism. How would the Council of Trent treat this gathering, not only this one but the first, also? All those prayers for peace - then those heart rending scenes from Aleppo last night. 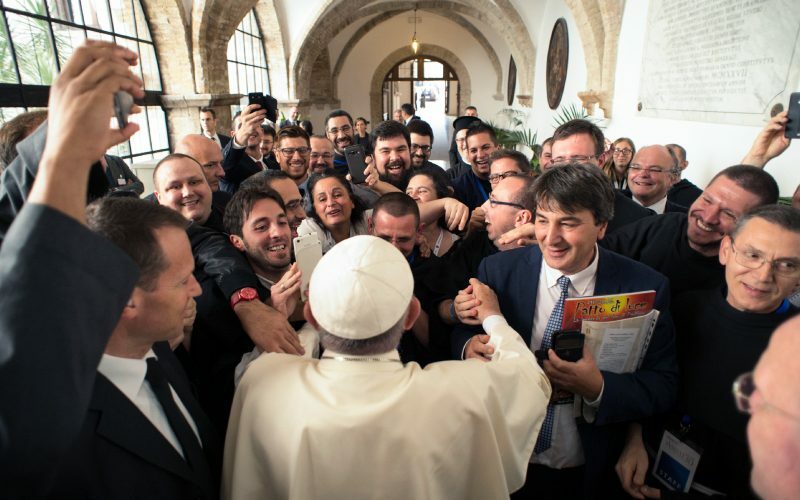 "I have always justified it to those Catholics who disapprove of 'Assisi', as being the Pope being recognised in some sense as 'leader' of all 'faith communities', I admit its not necessarily good theology." It's excellent theology for an Emperor Nero or for an Attila or Theoderic of Verona. But NOT for a Pope of the Catholic Church. St Peter was not trying to compete with Kaiaphas for recognition as Cohen Gadol ... of the newly formed Judaism which had just rejected Christ. Jews have perhaps changed, but Judaism hasn't, except insofar as losing the Temple has since then made the position of Cohen Gadol very irrelevant. "All those prayers for peace - then those heart rending scenes from Aleppo last night. When will it all end?" NOT by that type of peace prayers. Assisi II during Balkn war was followed by some of the worst massacres, including Srebrenica. If they pray together particularly non Christian's (not including Jews) then the Pope has broken the first commandment. It is not coherent the Pope would pray with the worshippers who follow false religious leaders (Mohammed) or idols as if the prayers to these have any efficacy. It is against Scripture and tradition and an example of how the papacy has gone crazy puffed it with its own ego. Because the Pope does it does not automatically sanctify it and this thought is just ultramontanist clap trap! Has the Pope learnt nothing? This sort of mouthing or words then contradicting the faith through action is what caused the Deformation in the 16th century. Does it take another St Paul to point out the hypocrisy of Peter? Again! There is only one true God and clearly some of those present worship false gods.For three successive popes to take part in these meetings is an affront to Our Lord Jesus Christ.Peace will not be obtained by confirming heretics in their heresy by encouraging and allowing them to pray to their false gods in the presence of the successor to Peter.The Pope has a mandate from Jesus Christ to go and teach all nations the truth. What we are now witnessing is a move to a one world religion alongside the political ambition of a one world government.Next year is the 100th anniversary of Our Blessed Ladys apparitions at Fatima.That is where the plan for world peace is to be found.If this Pope truly wants world peace then he must act in accordance with Her wishes. "For three successive popes to take part in these meetings is an affront to Our Lord Jesus Christ." It would have been an affront to Our Lord Jesus Christ for three successive Popes and one previous preparing it to do so, if they had been Popes and is also an affront if, as I think all three + "Paul VI" are antipopes. Cfr Montini 1970 and some Japanese conference of religions for peace.